This elegant, premium pedal is front-hinged and has a textured surface. 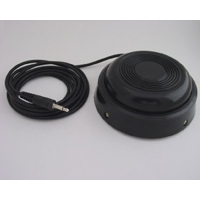 For most users it provides more comfort and control than the outer pedals of the Triple Action Foot Switch. 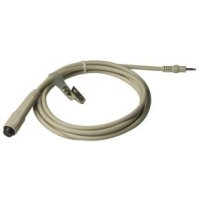 It comes with a 10' cable and works with all models (past and present) of Kinesis Contoured keyboards. 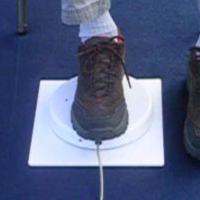 A self-adhesive, hook and loop tab is provided to anchor the pedal to the floor if desired. If you like this pedal's look and feel but want to use more than one at a time, or you want to change actions without re-programming your keyboard, you will need to purchase a special splitter. 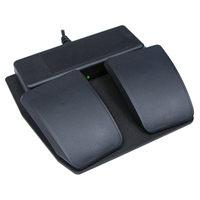 The Kinesis Advantage Dual Foot Switch Accessory is the most efficient way to utlilize the unique foot input options provided with all Kinesis Contoured keyboards. The default actions are "Keypad Shift" and "Shift". The "Keypad Shift" action turns on the embedded keypad layer as long as the pedal is held down. If the Keypad Toggle function key is tapped first, then the "Keypad Shift" pedal will turn OFF the embedded keypad layer while the pedal is held down. 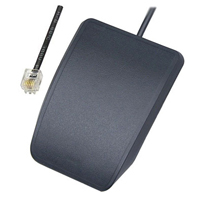 With a programmable Contoured keyboard, the foot switch may be configured to perform any user-defined keystroke or macro! 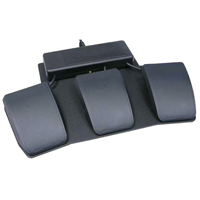 The Kinesis Triple-Action Foot Switch is the most efficient way to take advantage of the unique foot input options provided with all Kinesis Contoured keyboards. Default actions are "Keypad Shift," "Keypad Enter," and "Shift." The "Keypad Shift" action turns on the embedded keypad layer as long as the pedal is held down. If the Keypad Toggle function key is tapped first, then the "Keypad Shift" pedal will turn OFF the embedded keypad layer while the pedal is held down. 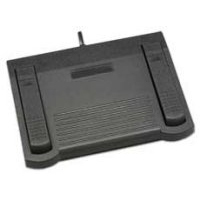 With a programmable Contoured keyboard, the foot switch may be configured to perform any user-defined keystroke or macro. 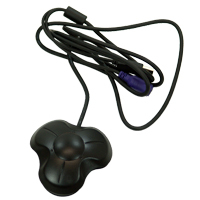 A Savant USB Foot Switch is factory programmed to perform mouse clicks. The compact design features a wide center pedal and two smaller outer pedals. 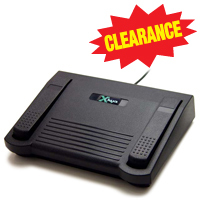 The large center pedal has minimal travel for your most heavily used key action and is factory programmed to perform the regular "left button" mouse click. The outer "piano-key" pedals offer two additional actions (right click and scrolling) without having to search for a second and third footswitch on the floor. Adjustment screws allow fine-tuning of pedal travel. NOTE: Custom programming these pedals requires access to a PC running 32 bit versions of Windows XP, VISTA, or 7.